I complain about the state of Malaysia’s internet like the rest of you. I have experienced the golden pastures of Korea and Japan, clocking ridiculous speeds in coffee shops and seeing that Speedtest needle redline like a a drift car attacking a course. I have experienced the time where not even an instagram picture would load while my phone proudly reported H+ with a smug satisfaction, like it wasn’t just H, it was better than that. 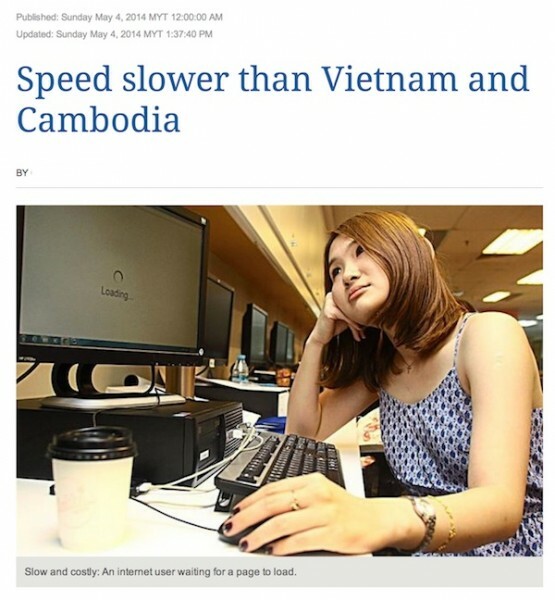 But when people were sharing this article from a daily that based on a study conducted by Ookla (of speedtest.net fame) proclaimed Malaysia to have, on average, slower (therefore worse) internet than neighbours Vietnam & Cambodia, even my jaded eyebrow was raised. Today I rise to the defence of our internet. The numbers don’t tell the full story and lead us on a roundabout journey of self loathing and MCMC complaints when in fact, we are not doing so badly at all. The number at the end of a speedtest is not the be all and end all, being able to take the test in more places anywhere in the country, is. 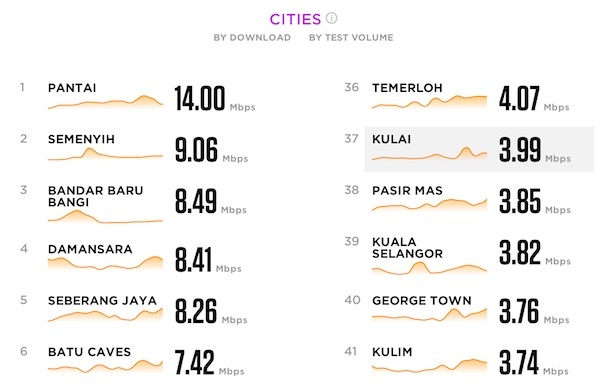 According to the study and subsequent article in question, Malaysia is ranked 126 (now 124) in the world for average broadband speed coming in at a paltry 5.48Mbps (now 5.63Mbps). The article goes on to say how Vietnam and Cambodia are ranked above us and that Malaysia is BARELY above Myanmar. 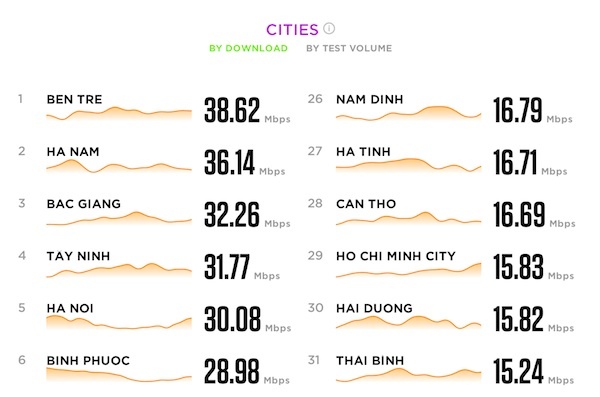 Compare these numbers to countries at the top of the table; Hong Kong sits pretty at the top with 80.46Mbps and Singapore coming in at 68.71Mbps, a far cry from the figures associated with Malaysia. At a glance to someone who is not inclined to find out what the numbers mean and how they were extracted, it looks like the state of internet in Malaysia is pathetic. We are around 10 times slower than Singapore and may as well be living in longhouses and trees with this internet, after all we are slower than countries like Madagascar (13Mbps) and Moldova (33.71Mbps). It all boils down to the methodology that Ookla employs for the Netindex survey. The survey as a whole is not wrong per se, but it’s extremely inaccurate. Ookla are the guys behind the broadband speed checker Speedtest.net. 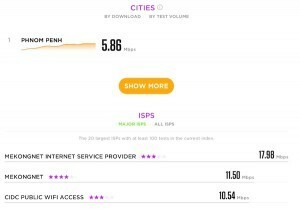 With apps on just about all the platforms, it is just about the most popular way to see how fast or slow your internet connection is. How Ookla compiled their data was that they use location information of where you are, which servers you are testing to and take an average across all tests done from within the country. It doesn’t matter if you are testing your brand new 20Mbps Unifi connection at home or if you are seeing if your phone has been throttled after using too much data on the go, if you tested on a Malaysian server on Malaysian soil it will record it as data. So what we have here is NOT a reflection on the state of the internet but an average SPEED across all speedtests that were run on the site from Malaysia. This already doesn’t sound like a test that can be used as any manner or yardstick, unlike a comparable one like say the Akamai State Of The Internet. 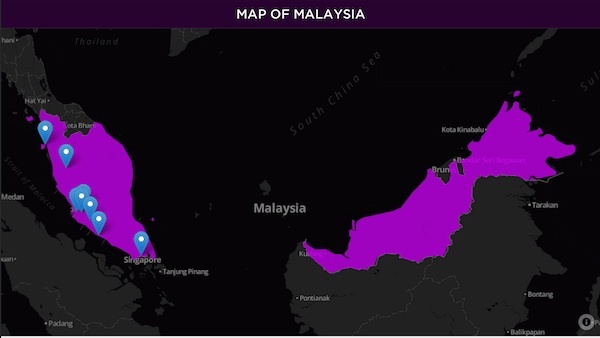 From what we can see here, both have faster average speeds than Malaysia but with a lower internet penetration rate means there are LESS people in the country percentage wise who have access to the internet as well as smartphones. This will most definitely skew the results of the test if conducted how Ookla did the Netindex table. With less people online, both mobile and fixed line. the sample size is a lot smaller and less accurate. Vietnam definitely has a very high average speed but if smartphone penetration and internet penetration is lower than Malaysia, it means that less people will be running this test on a smartphone (which has a slower capped speed) and less people will have access to the internet in general. Internet is only available in 1 city in Cambodia to a VERY small sample of people leading the average speed to be higher than Malaysia. Does that mean Cambodia’s internet is better than Malaysia? No. IT means the select few who get internet in the capital city, are very lucky indeed. 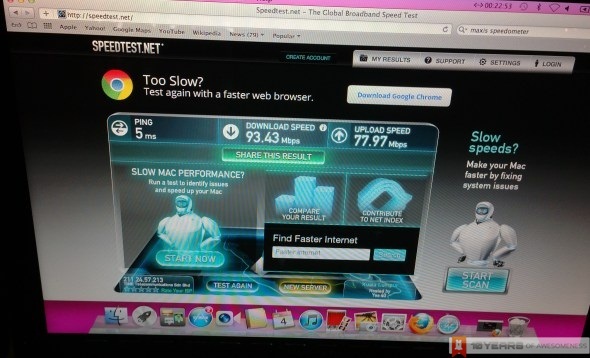 For me, I can live with 5.xMbps for my main line and 1-2Mbps for my phone. Most of the things I do online are not going to be any different on a 100Mbps connection. Sure, I can stream 1080p videos on youtube and download huge files in seconds but for the cost I’m happy with the minimum offered by UniFi here in the mainland. I do enjoy LTE on my iPad when I’m out and about but it’s more of a connectivity thing than the actual potential top speed. I believe connectivity and internet penetration is key to the future. Granted countries like Singapore have extremely high internet penetration, super high average speed and close to the best tech money can buy but we all must step back a bit and think, Singapore is all fibred up and that is no small task by a long shot. Singapore is small enough to be able to execute such a plan and in fact when I was growing up there, I remember the 1.5Mbps connection that was the mainstay in the early years of cable. Malaysia is not there yet, but not for the lack of trying. I think we don’t cut our ISP or Telco enough slack in this aspect. I salute everyone who brings HSBB to our homes, with UniFi growing from a niche thing only lucky people could have to a mainstay in just about every home in suburban Malaysia. I have never experienced outages or extremely slow speed (with the exception of an underwater cable problem) or problems at all in this respect. UniFi may not be available everywhere just yet, but for the expansion plans, it looks bright for TM. For the places that don’t have UniFi, telcos like YES have put towers in to give access to schools which are usually out of coverage range (despite the fracas over misappropriation of funds), DiGi is making inroads to bringing connectivity to Sabah and Sarawak, making good to their promise of “internet for all” and we even have a 100Mbps connection of our own with TIME and looking at the price, if you’re not bothered about a usage cap it’s pretty decent. The internet has become a human right according to Sweden and that’s where we are headed. Giving Malaysians EVERYWHERE access to affordable internet is the end goal and we are on the way. It may not be 100Mbps in Sibu, Sarawak but the fact that there is 4Mbps ADSL connection there is a very encouraging thing. The number at the end of a speedtest may be not as high as you want but at the end of the day, it doesn’t mean that money is not being spent to up the standard of the internet in Malaysia. Once we figure out how to drop prices to make it more affordable to the masses, how to get constant useable internet connections on our phones everywhere in the country and also how to make sure every citizen has access to a computer somehow, then we can look at that number at the end and push the boundaries there.